BEIJING: China said on Monday that it is considering the possible evacuation of its nationals from Haiti, which was struck by a devastating earthquake on Tuesday. For those who are still in Haiti, including Chinese nationals from the mainland and some Taiwan compatriots, "We will help evacuate them at their request," said Wei Wei, director of Foreign Ministry's Consular Department, at a news briefing. "Currently, some 30 Taiwan compatriots stay in Haiti. Relevant Chinese organization in Haiti has provided consular services to some who made requests," said Wei. Wei said the consular protection also goes to those Chinese illegal immigrants in Haiti. 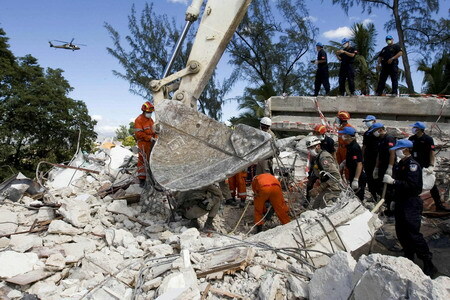 China sent a 60-member search and rescue team to quake-hit Haiti on Wednesday evening and the Red Cross Society of China has decided to donate US$1 million of emergency aid. On Friday, China decided to send emergency humanitarian aid package worth 30 million yuan (US$4.41 million) to the Caribbean country. The bodies of eight Chinese police officers who died in the Haiti quake have been retrieved and are expected to be brought home on Tuesday morning by a chartered plane. Currently, 125 Chinese peace-keeping police are in Haiti. A Foreign Ministry official said at the news briefing that China has made lots of contribution to the UN peace-keeping mission around the world, and would consider sending more peace-keepers to Haiti if needed. "China will consider that (sending more peace-keepers) according to the decisions made by the UN Security Council and UN request," said Yang Tao, counsellor of Foreign Ministry's International Department. Yang said China has so far sent 14,000 peace-keepers on 24 UN peace-keeping missions, and about 2,100 Chinese peace-keepers are working in ten mission areas. China has no diplomatic ties with Haiti, but the two countries have established business liaison offices for the convenience of trade, cultural and personnel exchanges.